Tired of hearing myself utter the words “I really want to go to Berlin”, I set about ticking off my new years resolutions (get to Berlin, go out more, pay off credit card…errr) and unwittingly booked myself an impulsive, totally last minute unaffordable affordable trip. 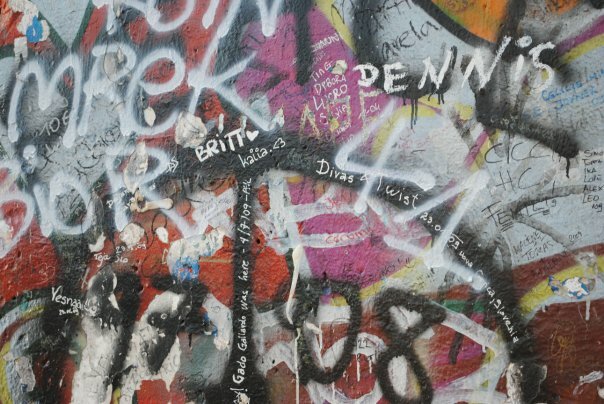 However, stepping off the plane and into seriously arctic conditions, I was fast to think “Why did I do this?” Over the following three, bitter-cold days I found out why; I whole-heartedly love Berlin and couldn’t help wonder why i’d waited quite so long. Wrapping up and venturing out, my long weekend was spent sight-seeing, sampling the local beer, visiting late night cafés and plenty or rather hip bars and clubs. So, I thought it only kind to share some of my finds, particularly the incredible restaurant Entweder Oder. Whether it’s for breakfast, lunch or drinks, Entweder Oder’s super friendly staff, delicious food and the coolest vibe make it by far one of the best places to kick-start your adventures. We stayed at: a lovely little apartment in the heart of fashionable Prenzlauer Berg, that’s owned by British/German creative duo Mark and Heike. We drank: cocktails and local beer at late night café Kani Mani which boasts a totally cool, authentic Berlin vibe and is perfectly placed on the famous Kastanienallee Strasse. 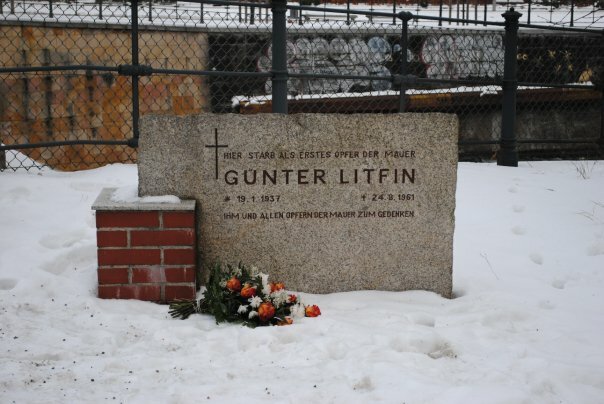 We walked: the route of the wall and saw the spot that marks Günter Litfin, the first person to be shot (at only 24) attempting to cross from West to East Berlin. We defrosted at: the hippest bar in ‘Prenz L’berg’; Schwarz Sauer. Despite its thick smoky atmosphere, this is where cool girls and guys take up residence from morning ‘till, well, morning. We ate at: Entweder Oder…the food, ambience and service was so good, we headed back for breakfast the following two days. We made enemies at: Küntsliche Beat Mung bar. Cool décor, excellent tunes and sadly, totally unfriendly crowd. 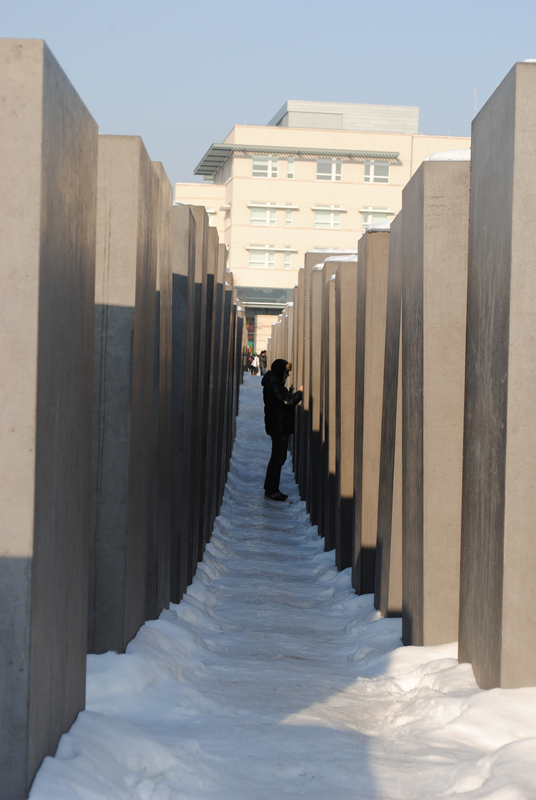 We saluted: the dead, at Denkmal für die ermordeten Juden Europas (the Holocaust memorial) and carefully stepped through its terrifying break-your-neck-and-everything-else ice paths. Go in summer to experience this haunting yet amazing installation to its full effect. We shopped at: vintage mecca Garage. Priced by the kilo, it’s needless to say I was in paradise and after loosing several hours, walked out with an entire bounty of leopard print for as little as 45 euros. We pit-stopped at: a Louisiana themed hostel bar where we snacked to the soundtrack of the loudest American starting a heated debate. We made a sharp exit and hopped over to super cool bar/restaurant White Trash. We practiced our German at: Café Oberwasser. After being handed a native-tongue menu and a ‘language’ book, we welcomed the surprise element to our evening, including the impromptu arrival of a four-piece jazz band. The perfect place for an authentic, romantic German experience – just make sure you can spend all evening there, you’ll need it. We haggled at: Mauerpark fleamarket, Prenzlauer Berg. It didn’t go well. The old lady continued to rant incomprehensible German as we swiftly moved on. 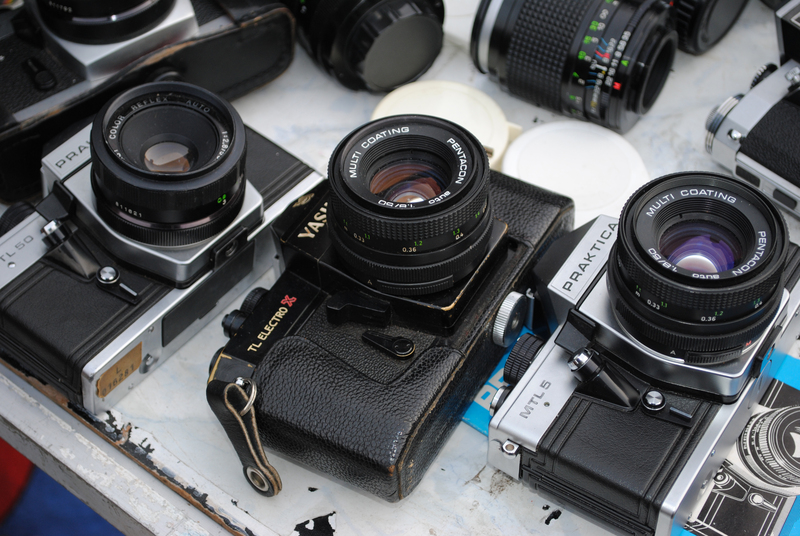 We photographed: old cameras and the biggest collection of vintage boots I’ve ever seen. Like being in a once-loved-wonderland, ‘jaw dropping’ is the only description that cuts it. We rushed: back to the airport, leaving just the way we arrived; catching the plane quite literally by the seat of our pants. 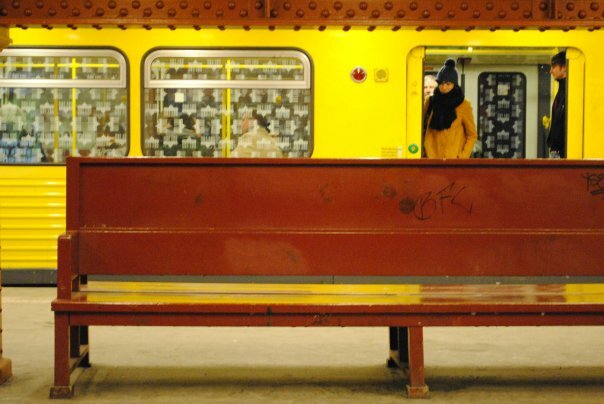 Addresses (with the underground (U bahn) or overground (S bahn) station you need). Kani Mani, Kastanienallee 95, U2, Eberswalder Stasse. Schwarz Sauer, Kastanienallee 13, U2, Eberswalder Stasse. Entweder Oder, Oderberger Strasse 13, U2, Eberswalder Stasse. Küntsliche BEATmung, Simon-Dach-Strasse 20, U1, S3, S5, S7, S9, S75 Warschauer Strasse (Friedrichshain district). Denkmal für die ermordeten Juden Europas (the Holocaust memorial), Cora-Berliner-Strasse U2, S1, S2, S26 Potzdamer Platz. White Trash, Schoenhauser Allee 6-7, Mitte. (We walked from Rosa-Luxembourgplatz, but the U bahn closest is Schoenhauser Allee). Café Oberwasser, Zionkirchstrasse 6, U8 Bernauer Strasse/M1 Zionkirchstrasse. Klub der Republik, Pappelallee 81. U2, Eberswalder Strasse. Flohmarkt am Mauerpark (Mauerpark fleamarket) Bernauer Strasse 63-64, Mitte, U2, Eberswalder Strasse. 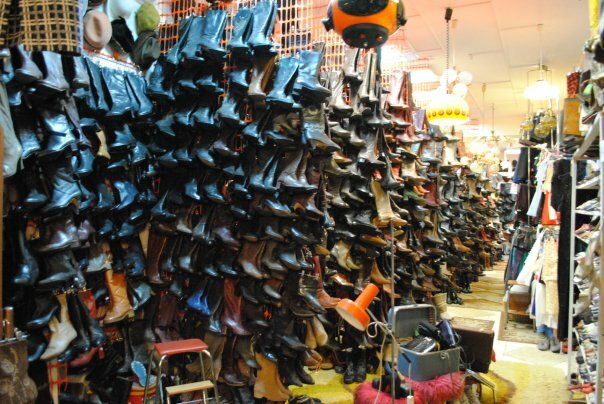 Vintage boot shop as pictured below (so in awe, i forgot to take its name) Eberswalder Stasse, U2, Eberswalder Stasse.